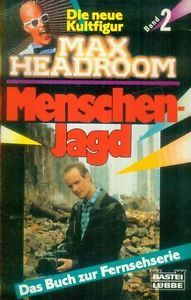 In a rather delightful turn of events, I have discovered that what seemed to be a few loose ends of Max Headroom in German pop culture turn out to have been a significant aftershock to the US/UK Max era. What may or may not have been a small number of producers and artists in northern Germany (in the Dusseldorf area) produced a significant body of Max-inspired and Max-related work, almost entirely in 1989. What's odd is that I don't know of any other translated or secondary works, other than a continuing amount of fan-fiction. Why the Germans latched onto Max (all the way through "Robert T-Online," more than ten years later) is hard to say, but it might have had something to do with Max's natural bond with techno music, which arose in part in the Dusseldorf nightclubs and bars in that era. It occurs to me that at least some of the Max shows must have aired in Germany in this time frame - but which, and when, and even if are all unknowns at this time. I'd love to hear from anyone who lived in Germany at that time and has a recollection of Max's intersection with German pop culture! 2.1 Max Headroom. Tödliche Spots. Band 1. 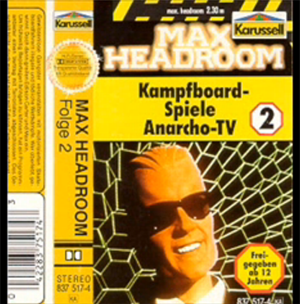 2.2 Max Headroom. Menschenjagd. Band 2. 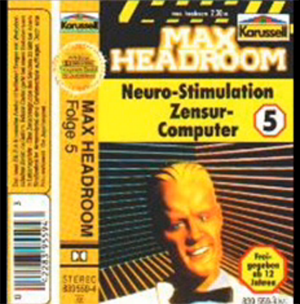 2.3 Max Headroom. Die Gesetzlosen. Band 3. 2.4 Max Headroom. Die falsche Göttin. Band 4. 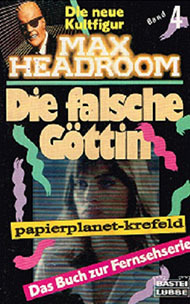 The cover of the 1989 telefilm book translation. This very rare book is a German translation of the original novelization of the telefilm, written by Steve Roberts. It is standard mass-market paperback sized rather than the oversized format of the original, and includes one black and white photo every four or five pages. It was translated by Thomas Ziegler and published in April, 1989. The MaxRchives contain a copy of this book. 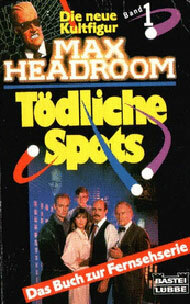 Following the telefilm book above, a series of Max Headroom books were published in German in 1989. I have not finished tracking them down or translating the available descriptions, but they seem to be novelizations of early episodes. There appears to be four in the series, all by German sf author and comics writer Hajo Breuen, who died just last year. The four titles I have located so far include are all subtitled Das Buch zur Fernsehserie - "The Book of the Television Series" - and Die Neue Kultfigur - "The New Cult Figure." Oddly, these and the picture book of the telefilm seem to be the only novelizations in any language. At least, that reached print. 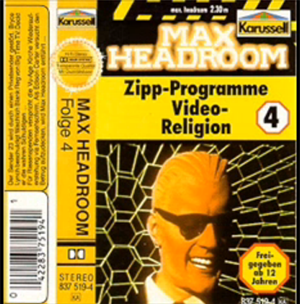 Max Headroom. Tödliche Spots. Band 1. 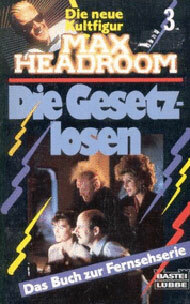 This appears to be a novelization of the telefilm or ABC pilot, "deadly spots" being the closest German translation of "blipverts." 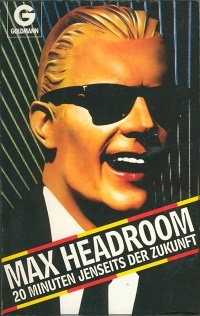 Max Headroom. Menschenjagd. Band 2. From other references, this appears to be a novelization of "Body Banks." 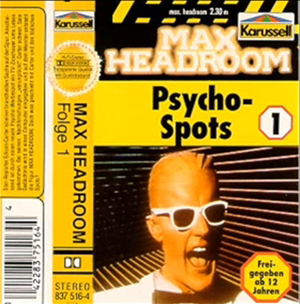 Max Headroom. Die Gesetzlosen. Band 3. A novelization of "The Blanks." 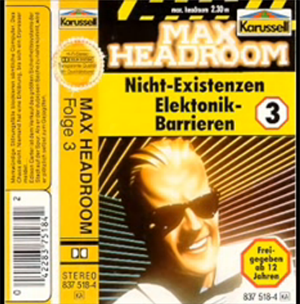 Max Headroom. Die falsche Göttin. Band 4. There's a really freaky little personal connection here. The author, Hajo Breuen, was born in Dusseldorf and died (somewhat young, at just under 60) in nearby Munchen-Gladbach. I've visited Germany once, flying in to Dusseldorf to spend a few days with a client in... Munchen-Gladbach. Side A is an adaptation of "Blipverts" and/or the origin telefilm. Side B is an adaptation of "Body Banks." The MaxRchives contain a copy of this recording. Side A is an adaptation of "Rakers." Side B is an adaptation of an unidentified episode, possibly "War." A side is an adaptation of "The Blanks." B side is an adaptation of "Security Systems." Side A is an adaptation of an unidentified episode, possibly "Grossberg's Return" or "Academy." Side B is an adaptation of "Deities." Side A is an adaptation of "Neurostim." Side B is an adaptation of an unidentified episode, possibly "Lessons." These dance mix albums and cuts are very weird items, mostly in that the major labels that released them make no acknowledgement to Chrysalis Productions, Channel Four, ABC, Lorimar or any of the other then-current rights holders. I can only conclude that the Germans didn't care, the Brits no longer cared, or "rights" were as sloppily assigned by letter or memo as they had been from Chrysalis to Lorimar/ABC. This bizarre little gem turned up in a catalog search recently. It's a CD "maxi-single," also released on 12-inch vinyl in 1989 by Polydor. It's hard to tell what the title actually is, because the cover reads as shown - MR.M.A.X. / MAX HEADROOM CALLING - but the spine reads MR. M.A.X. / HIT THE BEAT MAX!, and the inside list has, sandwiched between cuts of those titles, one titled MAX TO THE RHYTHM DUB. The title cut is included here as a sample. It is definitely a commercially-produced product by Polydor (offset-printed sleeve, smooth-edged pressed CD, all details such as catalog number and bar code)... but there is no copyright information except for Polydor. Which is sensible, as this disc has nothing to do with Max Headroom except for having borrowed the name and a famous image. The cuts are strictly run-of-the-mill techno/club mixes, and while the female vocalists repeatedly call (for/out) "Max Headroom," the "Max" lines are done by a very bad impersonator with a pronounced German accent. 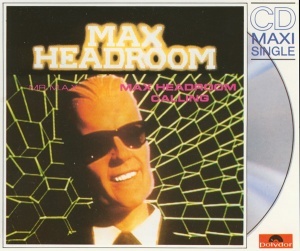 In the same time frame as the above single, a two-disc (vinyl and CD) dance mix album was released, headlined by the same MR. M.A.X. and appearing under the Max Headroom "brand." A complete track and production listing can be found at Discogs.com. 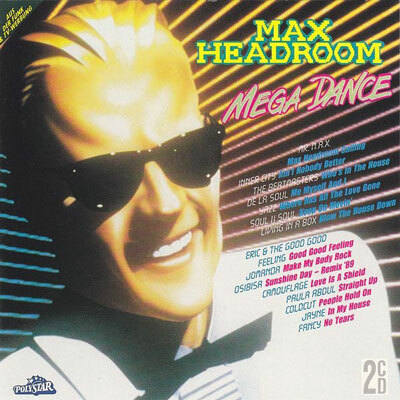 Yet another "Max Headroom Präsentiert (presents): Dance Hits" dance-mix album is listed at Discogs.com, as well. I suspect this is not a complete listing, but I will add to it as I find other examples of Max's brief, er, r-r-r-reich. This page was last modified on 24 September 2018, at 14:02.